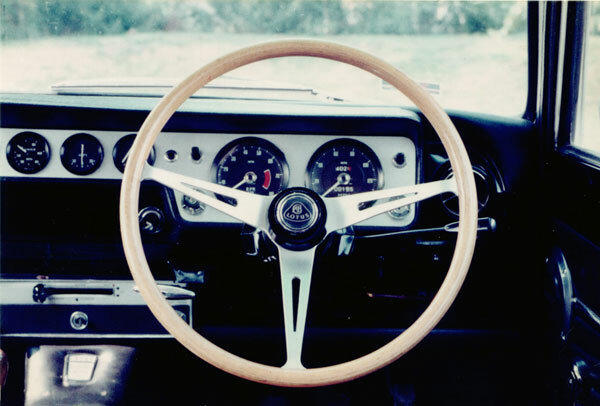 "The car was assembled at the Lotus factory at Cheshunt England in February of 1966. 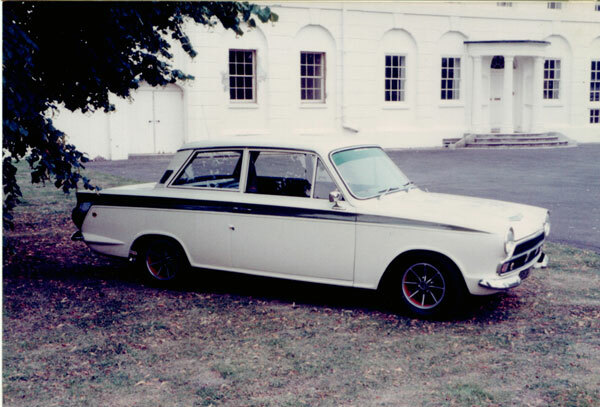 It was purchased by a large banking firm and used as a company car, first registered on 1 May 1966 and given the rego KGW 531D. In 1969 it was sold on to a Sgt in the British Army. In 1971 the Sgt sold it for the princely sum of 400 pounds to a very nice gent in Hounslow, Middlesex, England. The photos below date from this ownership, and show the extra green pin-stripes on the side and on the bonnet, that I am told came from the Lotus factory. This car is the only one I have seen with this extra striping." 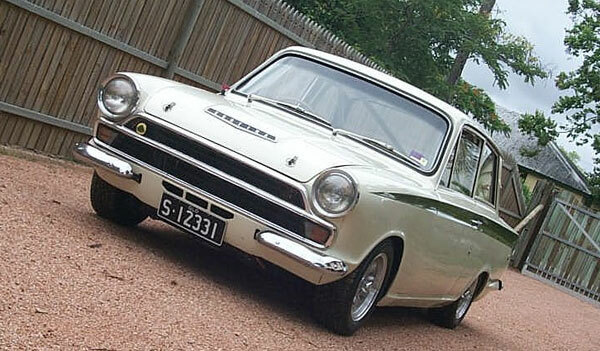 "During this period the car was a concours winner and was well known to the Lotus Cortina Registry. This particular owner took great care of KGW 531D and did not drive her in the rain, although he has told me a few tales about racing the old bill through the streets of Middlesex. It had just over 100,000 miles on the clock when it was sold in 1989 to a chap in New Zealand for the sum of 4,400 pounds." "In New Zealand the car was first used as a toy and show car till the owner became financially challenged. 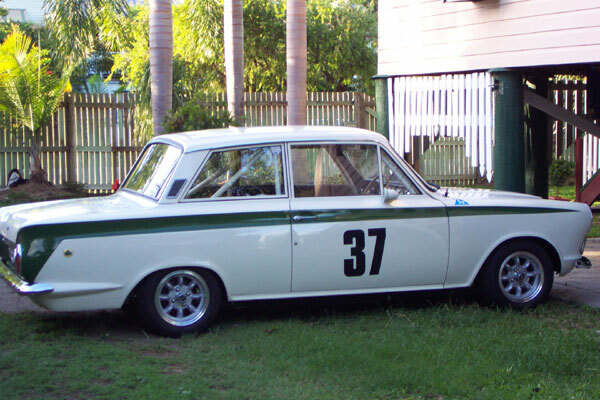 The car was snapped up by a Toyota dealer and converted to an Historic Touring Car. This gentlemen spent vast amounts of dollars converting it to full 1966 GP5 specs (check out fuel injection on the all steel motor). Other mods include the 4 link rear end, coil overs all round, an alloy race tank, LSD, 4 speed dog box, a full FIA approved cage, seam welded body and a stripped out interior." "Needless to say the car was very competitive and raced at a number of tracks including Mansfield and Pukekohe in New Zealand. The log books suggest that it was used extensively in the 90's. It even ventured across the Tasman Sea in 1993 where it competed at Eastern Creek (Australia). After a while (10 years to be exact) our Toyota dealer lost interest and sold the car on to a pilot. This gent raced the car for another season before advertising it for sale." "It is at this point that KGW 531D and I came together. The history was all there and the deal included all the original bits, even the engine and gearbox. And the price was right. The car was promptly sent packing across the Tasman Sea (once again) before being transported north to Townsville, here in Queensland. Thanks to some caring previous owners, I also got the original green log book, all the MOT's, receipts, photos, race log books, race catalouges, FIA papers for the mods and a certificate of description. Literally, a foot high paper trail of history on the car. After conversations with the previous owner who raced it extensively, I discovered that it had a knock to the front guard, but beyond this, the car was always raced 'clean', never put on its roof and definitely not re-bodied..Phew!!!!" After sorting through all the bits and pieces, the hard work began. 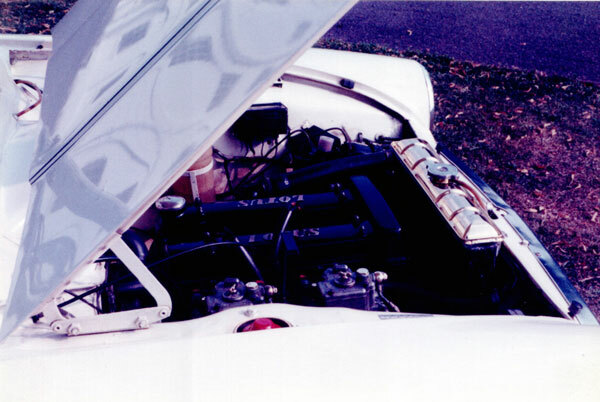 The paint was wrong, the original motor had been rebuilt but stored for 10 years and the interior had been gutted for racing. BUT, the shell was amazingly rust free and very straight. Even the original glass was still there- it had been etched KGW 531D by the owner in Hounslow. Photos (shown above) I received later from my Middlesex friend also indicated that a lot of the fittings he had added were still there, like the extra door locks etc." "The resto started with the motor. 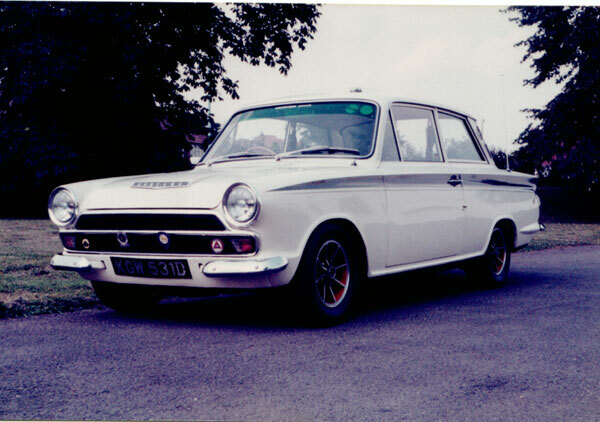 After contacting the Lotus Cortina Register, and checking with the ex-owner from Hounslow (still living at the same address), it was established that the motor I had really was the original. This donk had been rebuilt but never run while the previous owner dreamed of being Jim Clark. This was good news as the head and block numbers matched. The motor was complete, but needed to be stripped and reassembled. The Toyota dealer had inserted a set of John Ross forged pistons, some steel Cosworth connecting rods, Cosworth L2 cams and some nice stainless steel valves. Apart from that it was completely standard with no meat ever taken off the head! I asked my mechanic to make sure everything was all right, clearances checked etc. and it was balanced before final assembly. Installed, it now has a very usable 135 BHP and pulls like a train." "The car was put back on the road. I retained the rose-jointed four link rear end with the Watts linkage for handling. The 3.9 LSD was rebuilt, the heavy duty race clutch, alloy bellhousing and alloy tailshaft-housing were all left in place. I re-installed the original interior, re-painted the green flash the correct 'Sherwood Green', and de-numbered the car. I also refitted a lot of the original Lotus issued bits like the correct cam cover, air cleaner, brake booster, etc. I sourced and fitted a set of 13 x 6 superlites on 185 x 60 x 13 Yoko tires. I have kept the original Lotus steel wheels and those wild Dunlop mag-alloy wheels (see the older pictures) in the shed for the moment. The car is almost finished and is now used as a weekend driver and occasional track day warrior. Some concours people have commented that the car has been "over modified", but I like it the way it is. All modifications are period (GP5 spec from 1966), the car goes hard, handles well,turns heads, and looks and sounds fantastic (Well... I think so!). One day I may restore it to concours (I still have most of those bits - leaf spring, rear end etc). For the moment though, the smile factor is a big 10/10." "Thanks for reading, and if you're plodding away on a resto job, keep going. Its worth it in the end!"